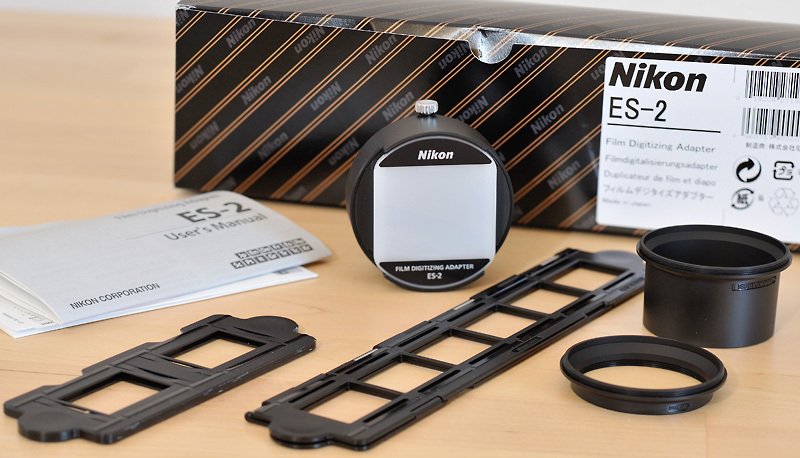 Last week B&H started shipping a new batch of the Nikon ES-2 film digitizing adapter set to existing pre-orders placed in November last year (the backlog is still pretty big). Usually, a development is a step forward. Yes, it's working! There are two positive points: the screw on the top for fixing the position, the negative frame is well done - it stops exactly in the right position, BUT: while the ES-1 is completely made out of metal the ES-2 is plastic except for the main tube. 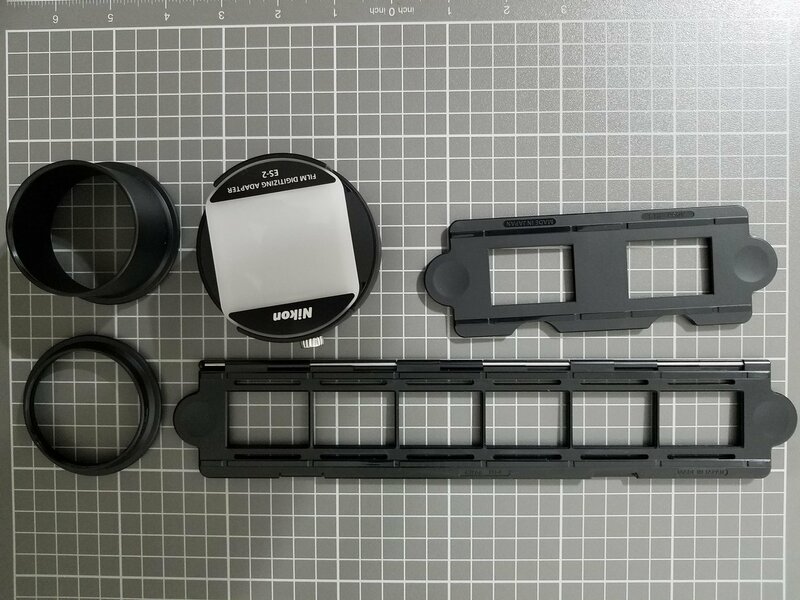 The adapter for the 60mm lens is plastic from Fotodiox (ES-1 comes also with Fotzodiox but metal. The holder for slides is garbage. It's only usable with this cheap thin paper slides. If you want to copy slides you need to put them one by one in the negative holder which takes a lot of time. And this for "cheap" 160€. The Nikon ES-2 was announced along with the D850 in summer 2017. Nine months later, the ES-2 became available in Germany. 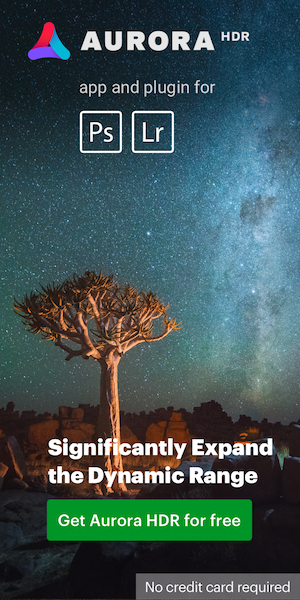 If you have a look at Nikon's websites, you get the impression the ES-2 is only usable in conjunction with the D850. Well, the D850 has got a special mode for photographing negatives and converting the images to positives. Nevertheless, the ES-2 is usable with every DSLR. Software that reverses the colours is not an invention of Nikon - I use VueScan for it, see my article How to digitize your slides and negatives. But it would be a good idea for Nikon to include such a software into the ES-2 package or to offer software updates for their current DSLRs! First of al,l there is the ES-2 itself. The built quality is good. Film and slide holder are loaded from the side. On the top there is a screw that locks both extension and rotation. That is a huge improvement over the ES-1, which lacks such a screw! The built-in extension tube is made of metal and has a 52mm male screw mount. 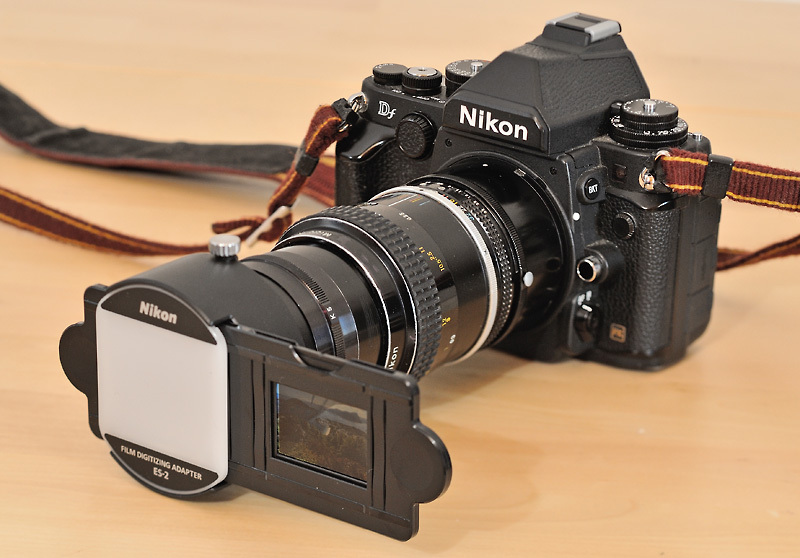 For using the ES-2 in conjunction with the 60mm Micro-Nikkors there are two 52mm-62mm adapters. The shorter one (extension: 9mm) is called "62mm adapter A", the longer one (extension: 33mm) "62mm adapter B". Type B is for the former Micro-Nikkors 60mm f/2.8. Because the current AF-S Micro-Nikkor 60mm f/2.8 is a heavy breather, it needs the short type A. Both adapters are made of plastic. If necessary, there are a lot of metal made alternatives available: use a 52-62mm screw mount adapter in conjunction with screw mount tubes. 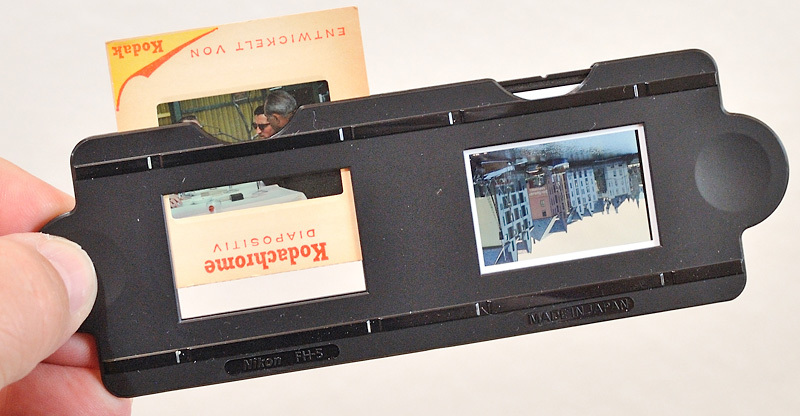 The FH-4 film-holder can hold 35mm film stripes with up to six images. When loaded into the ES-2 it clicks into place for each image, which simplifies the handling significantly! It is not possible to put a single slide mount into the ES-2. For slides, you always have to use the FH-5 that can hold up to two slides. Like the FH-4 it clicks into place. The combination FH-5 plus ES-2 only allows to hold slide mounts with a thickness of 2mm or less. That is a terrible design flaw! A Kodachrome slide from the 60s and a Y2K slide in plastic mount from the Fujichrome lab. The FH-5 works fine with these slide mounts. The FH-5 works fine with thin slide mounts. But with thicker mounts (more than 2mm) the ES-2 setup is simply not usable. You have to dismount your slides, which is not a good idea! For example: I used Gepe glassless mounts with metal masks - 3mm thick - for many years. 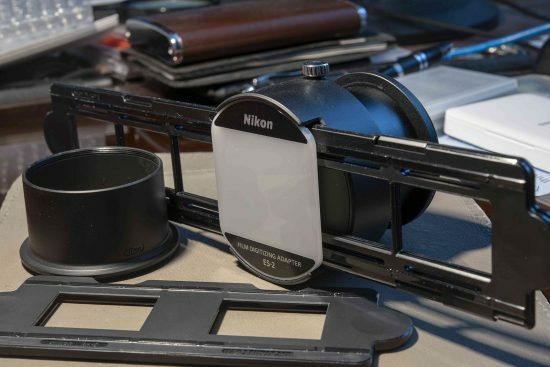 Many serious photographers use(d) these mounts. They don't fit into the FH-5! Moreover, Nikon does not even bother to publish this restriction! My 3mm Gepe glassless mounts with metal mask don't fit into the FH-5! 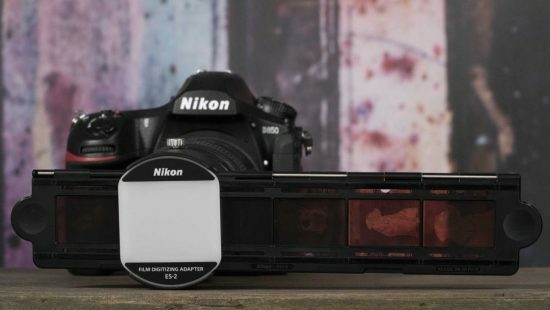 For photographing film stripes (or slides in thin mounts) the ES-2 is the best setup Nikon has ever produced. While the ES-1 needs re-aligning after each swapping of the source image, it is not necessary with the ES-2 thanks to it's locking screw. Every former setup (ES-1 or a bellow setup) requires a positioning of the piece of film. Due to the click-in-place functionality of the FHs that is not necessary with the ES-2. Well-working setup: Nikon Df plus AF-S Micro-Nikkor 60mm f/2.8 plus "62mm adapter A" plus ES-2 plus FH-4. According to the user's manual, the ES-2 set is targeted at the AF-S Micro-Nikkor 40mm /f2.8 DX on a DX camera (no adapter needed) and at the 60mm Micro-Nikkors on an FX body (with adapters as mentioned above). 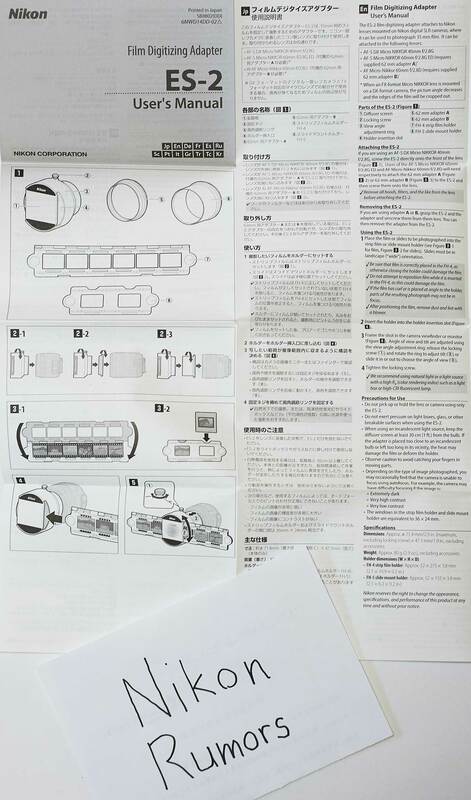 Furthermore, the manual says, the combination of an FX-format Micro-Nikkor lens and a DX camera would crop out the edges of the film. That is not true for the AF-S 60mm f/2.8 if you use adapter B. I tried this combination on my Nikon D5100 successfully. For the older 60mm f/2.8 you will need an additional screw-mount tube (well, Nikon could have put another plastic-tube into the set...). Nikon Df plus Nikon PK-12 tube plus Micro-Nikkor 55mm f/3.5 plus Nikon K5 (52mm screw-mount tube) plus ES-2 plus FH-5. I received an ES-2 on Friday last week and mounted it on an old 55 mm f3.5 Micro Nikkor. It works just fine. What nobody has mentioned so far is that the locking screw on the unit not only allows the slide mount holder to rotate AND also move closer and further from the lens. There is a good 15 mm of extension possible. I'd bought a couple of 52mm extension tubes off Amazon (7mm and 14mm) and took the glass out of two 52mm filters so I could get enough distance with the lens focused at 1:1. Did not need them. When I get back from a business trip I will try the ES-2 with my 70-180 Micro Nikkor. I'll need an extension tube between the lens and the camera to get to 1:1 and I'm confident I can find the right combination of extension tubes between the lens and the ES-2 so it will work. (My guess is that the 55 will be easier in the long term). My guess is that if one is willing to fiddle with extra extension tubes to get the right lens to ES-2 distance that any lens focused close enough for 1:1 can be made to work. Overall, I'm impressed with the quality of the copy images on a D850 and cannot wait to start doing some serious copying of old 'chromes and B&W stuff. Other points: Manual focus is a MUST as far as I'm concerned with live-view and using the locking screw to rotate the mount and vary the distance to achieve the right framing is tricky at first but ultimately works well. 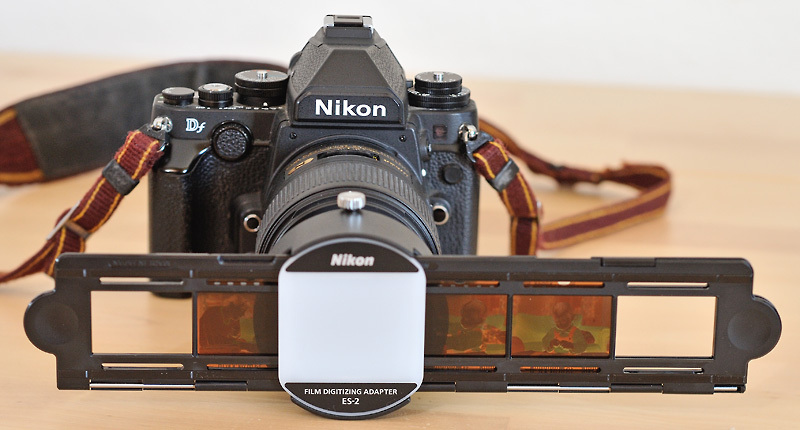 As other reviewers have noted the slide and film strip holders are notched so that they center themselves. If you have a large collection of slides or film and a high-quality Nikon DSLR like the D850, the Nikon ES-2 Film Digitizing Adapter is a convenient way to digitise them. It won’t be a fast exercise but it’s feasible to digitise slides, transparencies and negative in batches once you get into a routine. The ES-2 does a good job, but you may be surprised by the amount of grain visible if you zoom into 100% on-screen to check sharpness and detail. Obviously doing so will require you to shoot in RAW and process the files manually, but I believe this will lead to the best results anyway as I found nothing special about the Nikon D850's built-in "Digitizer Mode" that would warrant going out and purchasing a D850 just to use this adapter. This entry was posted in Nikon Lenses and tagged Nikon ES-2 film digitizing adapter set. Bookmark the permalink. Trackbacks are closed, but you can post a comment.